Eight pounds of green beans, 3 pounds of carrots, 3 pound of beets were made into juice. Called bean juice since it was the predominant vegetable. Beans are tedious to pick since the plant must be held while the bean pod is removed to prevent disturbing the root. The slurry after going through the 2 mm mesh food mill left almost no residue. The juice is most pleasant. Annotated pictures depict the procedure. 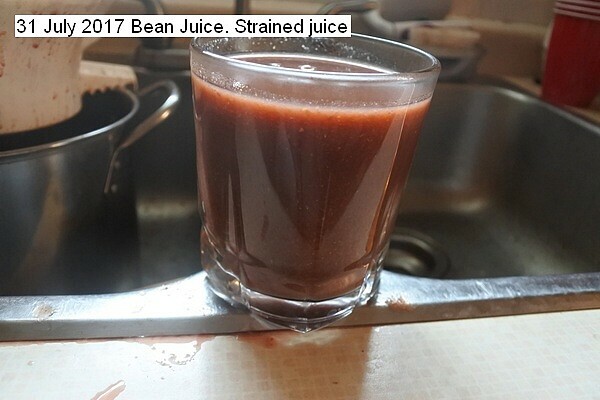 This entry was posted in Uncategorized and tagged 31 July 2017 Bean Juice, Bean juice. Bookmark the permalink.